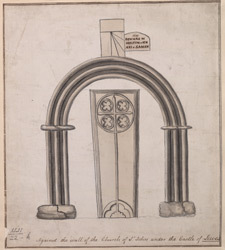 One of several drawings of monuments inside St John's Church, under Lewes Castle. The church was built within the Anglo-Saxon fort here. Daniel Defoe wrote Lewes was ' a fine pleasant town, well built, agreeably situated in the middle of open champaign country, and on the edge of the South Downs, the pleasantest, and most delightful of their kind in the nation; it lies on the bank of a little wholsome fresh river, within twelve miles of the sea'. He also considered the town is 'full of gentlemen of good families and fortunes'.